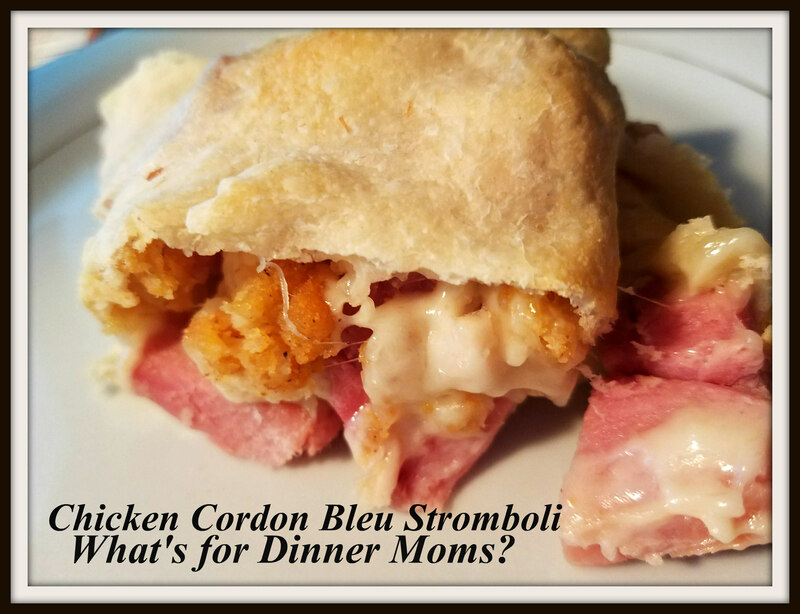 Chicken Cordon Bleu Stromboli – What's for Dinner Moms? So many people are looking for leftover ham recipes. 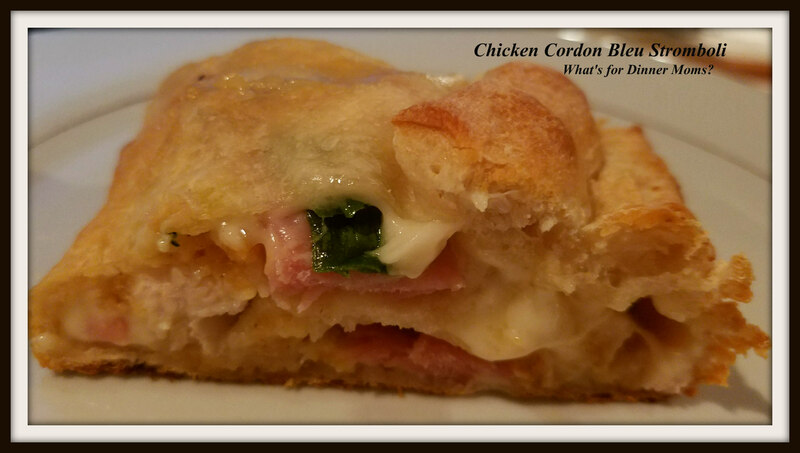 I have so many but one of our favorite is the Chicken Cordon Bleu Stromboli. This is great for using up 2 leftovers. After Easter dinner we don’t want ham again right away so my daughter made chicken tenders for her and her friend. I had her throw a few extra on the sheet so that I could make this for dinner for everyone else. If you don’t have frozen chicken tenders, patties, or even strips on hand you can make this with leftover chicken breast pieces too. This week is all about EASY! Simple meals, that can be done in little to no time. Planning ahead and trying to help my family recover from the last month that I was away. This perfectly fit all the things I needed for a dinner. I made two of these, one with onions and one without. Though you can make this without the green onions it is so much better with it! It adds that little something to the flavor that makes it so much better. The onion less Stromboli was good but we all felt like it was lacking in flavor. Serve this with a nice salad of baby greens or spinach and you have a complete meal on the table in about 30 minutes if you have leftovers on hand! The leftovers were quickly claimed and packaged for lunch the next day along with a side of Dijon mustard for dipping. Preheat oven to 350 degrees. Spray a rimmed baking sheet with non-stick spray or use parchment paper. Spread one tube of dough out into a rectangle. If desired spread a thin layer of Dijon mustard over the dough leaving a 1/2″ frame around the edges plain. Sprinkle 1/2 the cheese, chicken, and ham over the Dijon mustard. Finish by sprinkling the onion over the top. From one of the long sides start rolling the dough until it makes a pin wheel. Pinch the ends shut and the seam across the top. Turn the dough so the seam side is on the bottom. Add slices across the top every 2″-3″ to let steam escape. Complete the second roll and bake for 25-30 minutes until well browned and cooked through. Allow the bread to rest for 5 minutes before serving. Thank you, Lynn for all your encouraging comments! I love that you print these. Thank you! This looks really tasty. I smiled at your quip about making it with no onions, I thought I as the only person in the world who couldn’t eat onions. I have an allergy, they make me really ill.
Nope my daughter detests onions. It is her kryptonite she can spot one at 50 paces. I have never heard of an onion allergy before, wow! Thank you! Hope you like it. We ❤ corned beef!